When we moved into our current home two years ago I searched for children’s books to prepare my 3-year-old son for the adventure. We were moving to a different house in the same town. Many of the books that I checked out at the library were about moving far away from friends and family. Other books gave too many examples of negative feelings that my son wasn’t experiencing. I finally found one that was just what we were looking for, “Usborne First Experiences, Moving House”. It describes, in a very matter-of-fact way, the things that happen when a family moves from one house to another. It would still be a good read if the family is moving to a new town or state. This book would not be appropriate if the whole family is not moving together. We recently had some friends decide to move out of state for a new job. This situation called for a different book. My now 5-year-old son, became upset when we looked on the giant laminated map in the play room to see just how far away his friends were moving. He began wandering around the room wildly swinging his stuffed monkey. He was saying things like, “I’m going to put a big sign on their house saying that they can’t move!” and “I’m going to put big rocks and cactus in front of their moving van so they can’t go.” I suggested that he draw a picture of those things to give to his friends so they would know he didn’t want them to move. I continued to explain that they still needed to move even though he felt like he didn’t want them to (sidebar: this reminds me of Uncle Wayne’s lecture on needs, wants, and desires which I’ll have to recreate in another post). Anyways, I remembered a book I had gotten a while ago called, “A House for Hermit Crab” by Eric Carle. After reading the story about the hermit crab who must move on to a bigger shell and leave his friends behind, my son totally “got it”. He said, “Oh, we should give this book to [our friends] G and L since they are moving.” He seemed to find the story very comforting and something about it just made sense to him. *Psycho-babble alert: Animals portrayed with human emotions and thoughts can often help children deal with complex and difficult emotions and/or situations. Another great story about moving and change is “The Value of Adventure: The Story of Sacagawea” by Ann Donegan Johnson. This book is part of the “Value Tales” series. These books are dated in their use of politically incorrect terms, some of which are considered to be offensive today. I simply re-read over these words with the current politically correct terms. For example, I say “Native American” when I see the word “Indian” in this story. 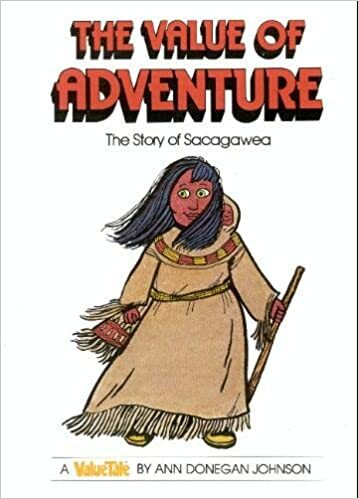 In this story, Sacagawea continues to have a positive attitude about where she is being taken (against her will) and somehow manages to see it all as a grand adventure. This would be especially relevant for children since they usually don’t have any choice in the matter of a family move. My final thought on this topic for now, is that books in general may be highly beneficial to children during a move or any other time of stress. Books are comforting. Being read to is comforting. Snuggle up on the couch and read books about moving with your kids. My thought is that reading the same books before you announce the move, during the moving process, and again when you arrive in your new destination would be helpful and comforting. We’ve all heard about the importance of being consistent. It seems that the consistency of the same stories and pictures throughout the moving process would provide a sort of emotional anchor tying the readers to the listeners. If you read books that you and your children enjoy and the stories are relevant to what you are going through as a family it would strengthen the ties that hold you together and have a calming effect on everyone. 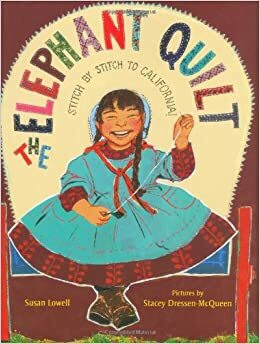 and “The Elephant Quilt: Stitch by Stitch to California” by Susan Lowell, pictures by Stacey McQueen. 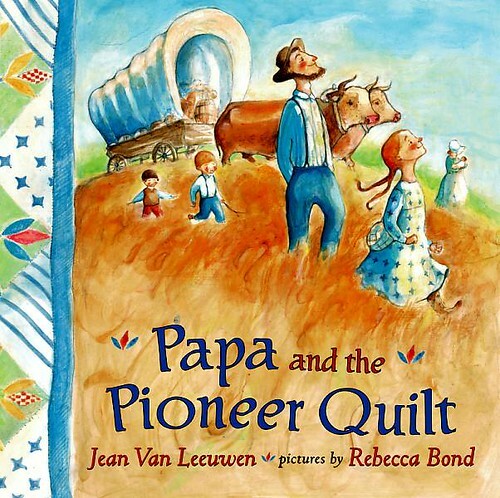 As you might guess, these two books are about pioneer families. One family travels from Pennsylvania to Oregon and the other from Missouri to California. My son really loved these stories. Well…., wait a minute perhaps I’m projecting a little. Let me correct myself, “I” really really loved these stories! They made me feel better about the move! After Google-ing “How to help children cope with a long distance move” I repeatedly read that the most important factor in a smooth transition for children was a low stress level in the parents! Oh great! It seems that the one thing I actually have control over, how I am handling the stress of the move is also the most important thing for my kids. Unfortunately, it’s also the thing that I’m the worst at doing. Read good books about moving. Check. Prepare them in advance. Check. Listen to their feelings. Check. Let them help pack. Check. Be sure to keep your stress level as low as possible… Ahhh!!!! !For some reason I was drawn to these books about pioneers and for some reason the stories really resonated with me. Stories about leaving behind extended family and packing up your little clan and setting out West (or East in our case). Stories about feeling sad to leave behind everything your family knows and excited about the prospect of what might be waiting for your family at the other side. I think that these last two recommendations may have helped me more than the kids. Perhaps a beneficial side effect will be helping the kids to cope with the move too. Ho for North Carolina!